Accidents can happen to anyone, to anything, at any time. 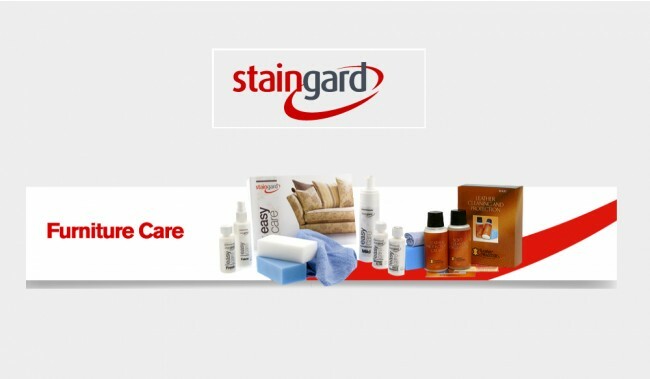 Staingard’s high performance range of furniture care products lead the way in the furniture industry. Offering specifically formulated solutions, creams and cleaning cloths perfect for cleaning, stain removal and surface cleaning or polishing. Easy to use, with innovative storage boxes and simple instructions. Staingard Care Kits provide special products which help protect and maintain the appearance of furniture week after week. The care plan provides cover for a comprehensive range of household accidents that result in damage or staining to your furniture. Following the delivery of your furniture you will receive a document detailing this and also how to make a claim. It's important to recognise that you're not covered for a lack of care of your furniture or abuse, and multiple stains and damages sustained over an extended period of time are similarly not covered. This is a summary only. Please refer to your certificate of cover for full terms and conditions.